If you have a high temperature furnace, Thermbond has an insulating solution for you. Using a combination of resources only available from Thermbond, we will deploy an expert team to audit your current situation, design a complete engineered solution incorporating state-of-the-art Maftec™ polycrystalline fiber, present you with a clear return on investment to justify the program, manage the complete installation and follow through with a post-job thermal audit to demonstrate the success of the installation. You will know how much you can and will save before you invest a penny. MAFTEC™ is radically different than ceramic fiber. 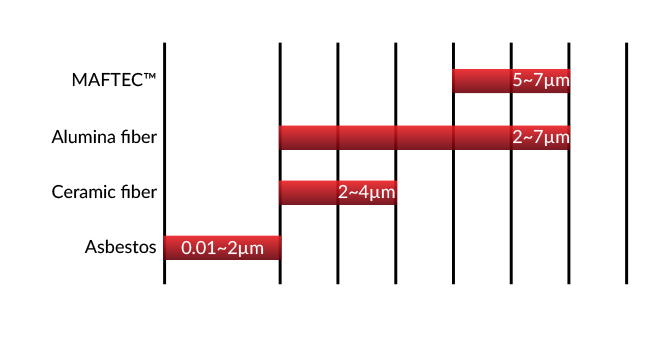 Shrinkage gaps open in ceramic fiber insulation and lower its heat-retaining ability. This results in frequent furnace downtime for moderate maintenance, to serious structural overhauls. This downtime ultimately costs time and money in servicing and lost production. MAFTEC™ can change the vicious cycle of furnace downtime. MAFTEC’S™ pure mullite composition along with markedly robust physical properties means it does not experience molecular change through a wide temperature range, up until it melts at 3362° (1850°C). The mullite molecule of the MAFTEC™ fiber also provides for excellent chemical stability through its’ recommended use limits. MAFTEC™ delivers remarkable durability and insulation properties, due to its crystal structure. After manufacturing the Al2O3SiO2 mullite that comprises MAFTEC™, it is spun into fibers with precisely-controlled diameters. The fiber manufacturing technology creates an extremely low amount of shot in the fiber matrix, resulting in almost no inclusions to degrade the thermal insulating properties, or the physical robustness of the fiber matrix. MAFTEC™ blankets are strengthened by a unique needle stitching process, forming durable, uniform blankets. 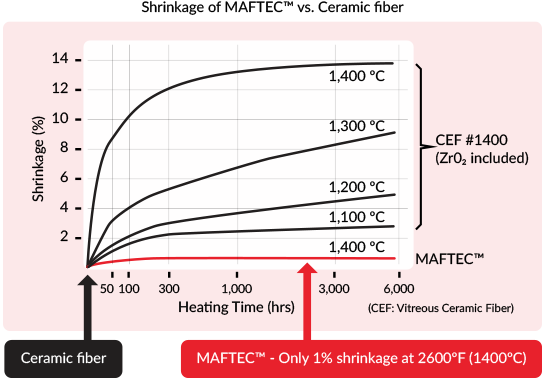 MAFTEC™ offers low thermal conductivity when compared to commonly-used high-heat insulation material. Significant dead-air space between MAFTEC™ fibers limits heat conductivity, by preventing heat transport between the trapped air spaces. The MAFTEC™ fibers strongly block radiant heat transmission, preventing significant amounts of infrared heat from passing through the material. MAFTEC™ fiber diameter is above 3 micrometers and therefore non-respirable according to the World Health Organization. A beneficial by-product of MAFTEC‘s™ fiber diameter and uniform size is the high level of inherent health safety that results from the fibers being larger than respirable limit, as determined by the World Health Organization.